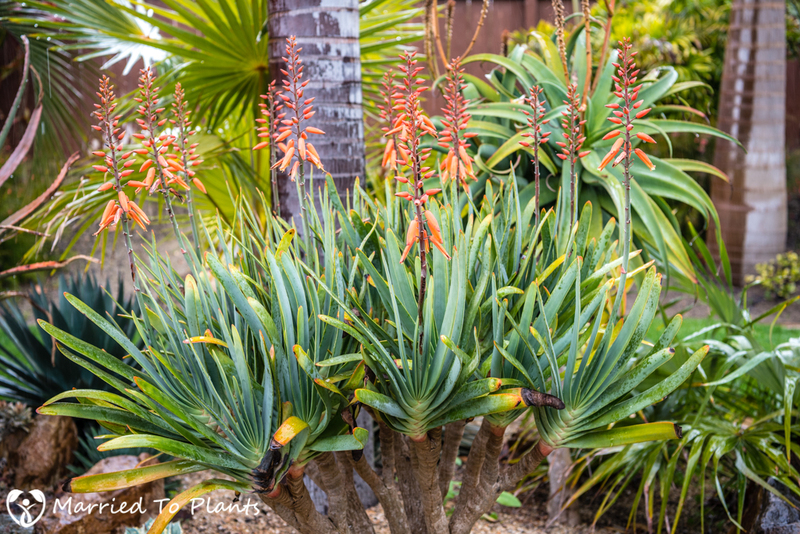 As one might have guessed from many of my recent posts, I really do love aloes. I have found them to be quite adaptable in almost any garden setting. 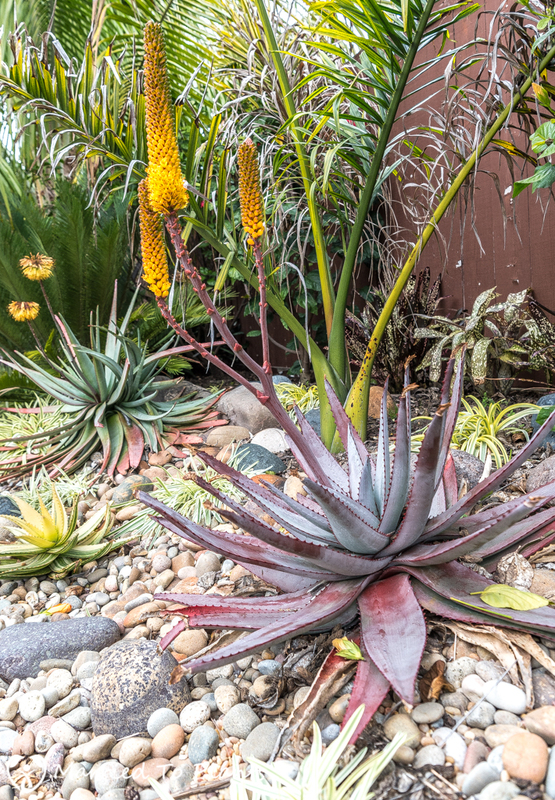 Along with my xeriscaping, I have intermingled aloes throughout my tropical areas as well. With my free-draining decomposed granite, they actually do very well with a lot of irrigation. Plus they contrast fantastically with the palms and leafy tropicals. 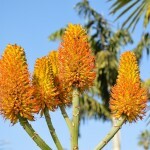 However, the best thing about them for me is that the aloe blooming season is when most plants in my yard are dormant. Winter is the time of the aloe. 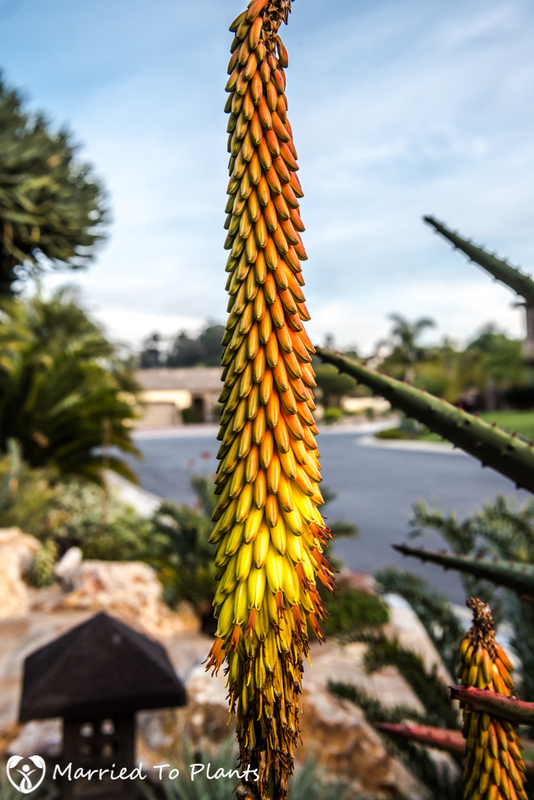 So while you might be reading about a “wildflower super bloom” out in our deserts right now (post coming next week on this), there is an aloe ‘super bloom’ happening right in my garden. Let’s start with one of my favorite aloes: Aloe rupestris. 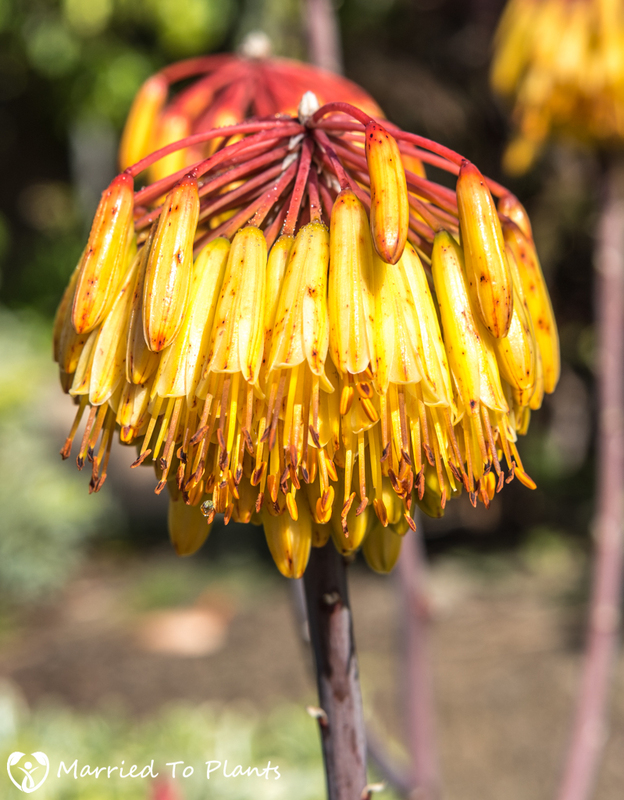 Aloe rupestris is a beautiful aloe when not in flower, but of course it really shines when blooming. 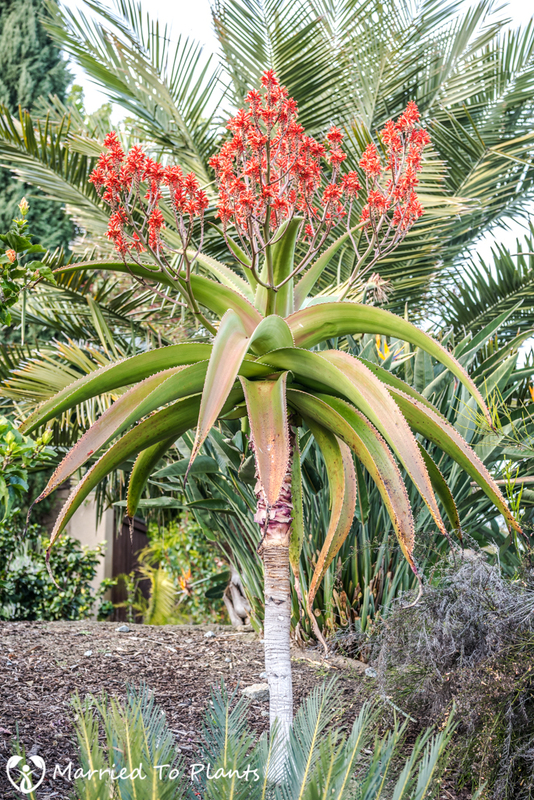 Most Aloe rupestris found in Southern California tend to be cumpers. I was able to find this naturally growing, single-stem plant last year in the garden of an owner that no longer wanted it. It was the best $50 I have spent in a while. Due to a recent transplant, I didn’t expect to see this aloe blooming this fantastically. 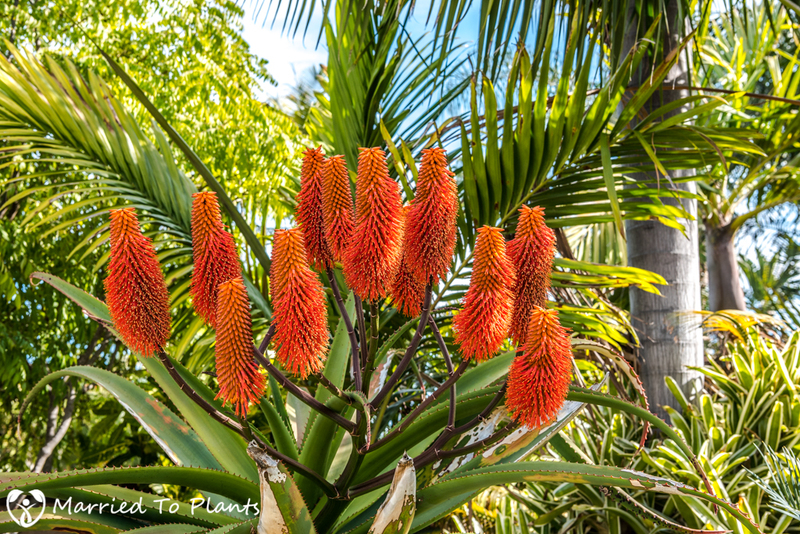 The common name for Aloe rupestris is the Bottlebrush Aloe, and it certainly lives up to its name. Sadly, these beautiful, brightly colored orange flowers do not last long. So you only get to enjoy them for about a week once they start to open. 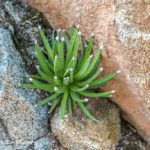 A close relative to Aloe rupestris is Aloe thraskii. Aloe thraskii does amazingly well with a lot of irrigation. I needed my son in the picture below for scale to show just how large this plant really is. The base is as large as my thigh. 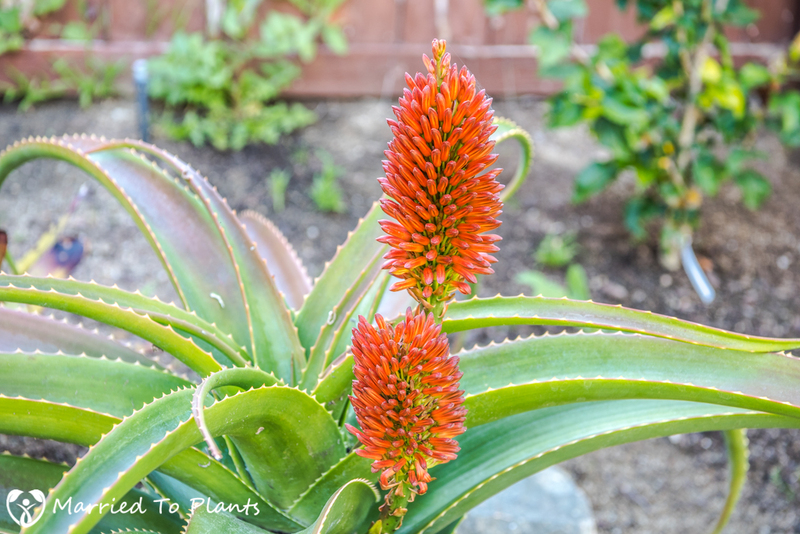 Planted not far from my Aloe thraskii is this Aloe sabaea shown below. Out of bloom, they have a similar droopy-leaf appearance which I enjoy. In bloom, it is easy to see they are in fact not very closely related. 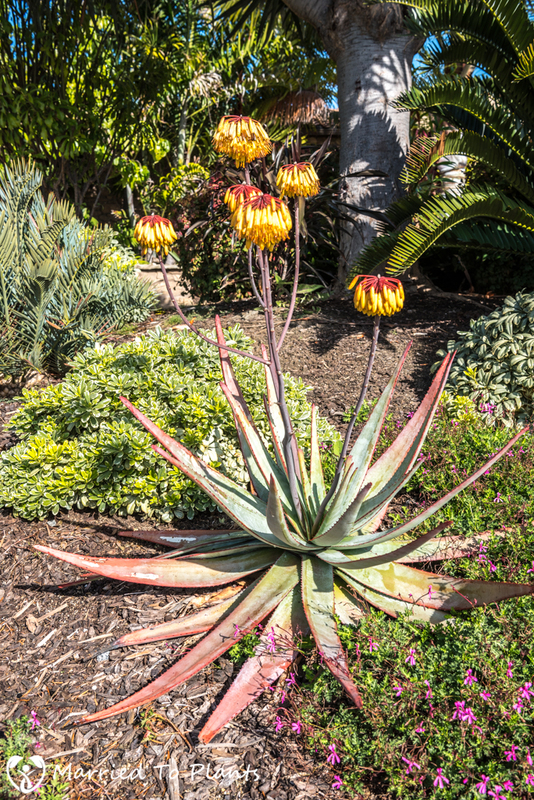 Aloe thraskii comes from South Africa, and Aloe sabaea from Yemen. Another oddball aloe I really enjoy in my garden is Aloe munchii. This Zimbabwean native below has branched into a three-headed monster. The stem is pretty thin and I worry that it will get too top heavy at some point. 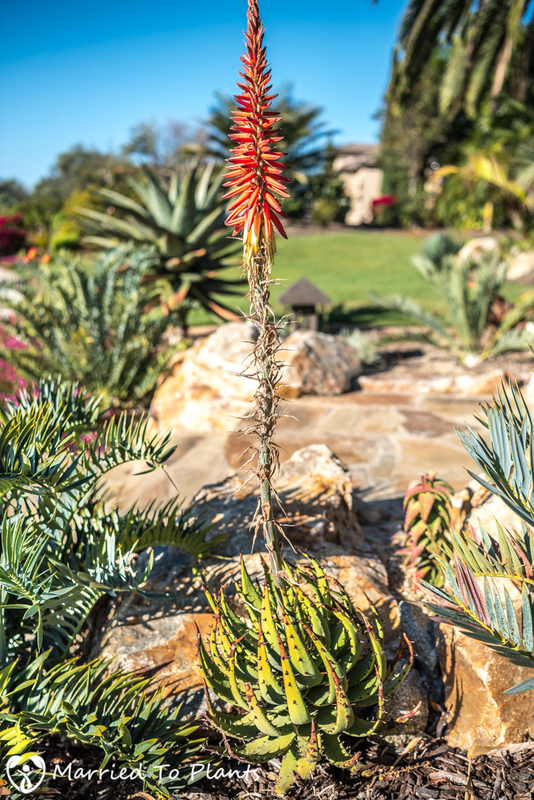 Aloe marlothii is one of the most popular aloes found planted in Southern California gardens. 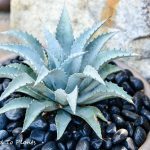 The blueish, spiky leaves make it a handsome year-round addition, and when in flower, not many aloes can rival it. I forgot to get a photograph of the entire plant while it was in flower, but shown below is the first flower from a small Aloe aculeata I planted a few years ago. My Aloe aculeata only sent up an inflorescence with two racemes, but with each new year more will be added. 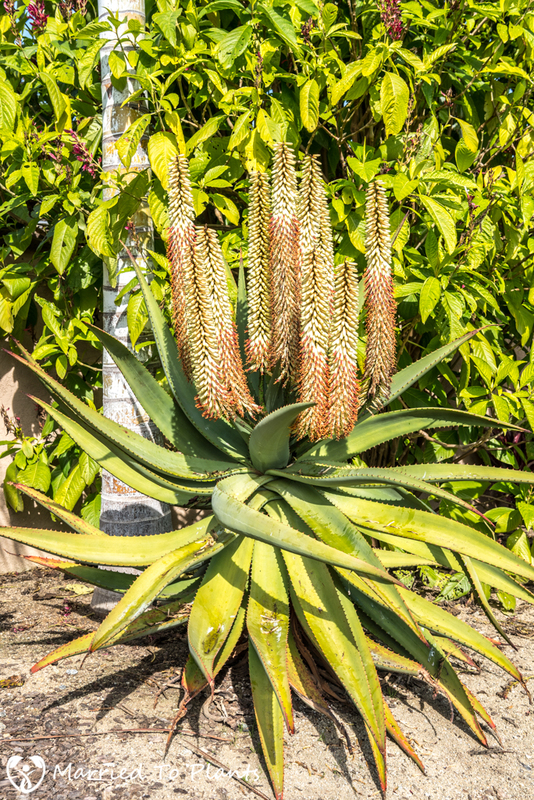 Mature Aloe aculeata are one of the showiest aloes when in flower. 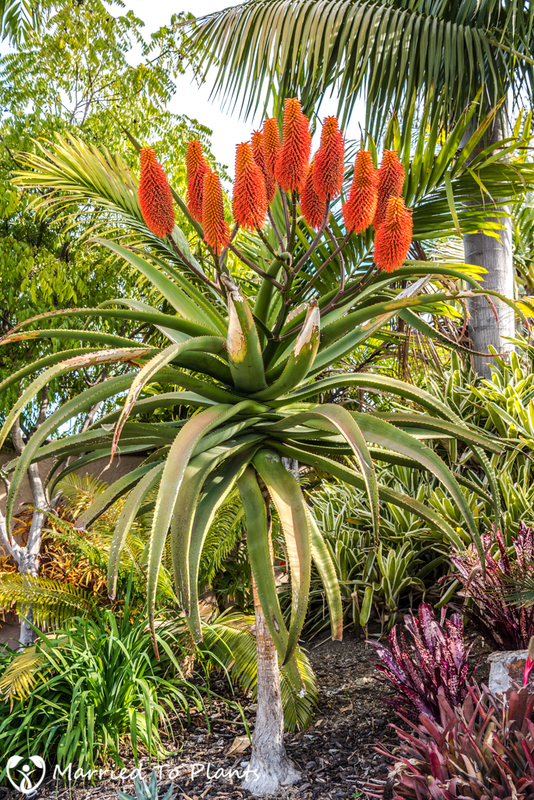 Aloe ferox is another very popular aloe found in Southern Californian gardens. 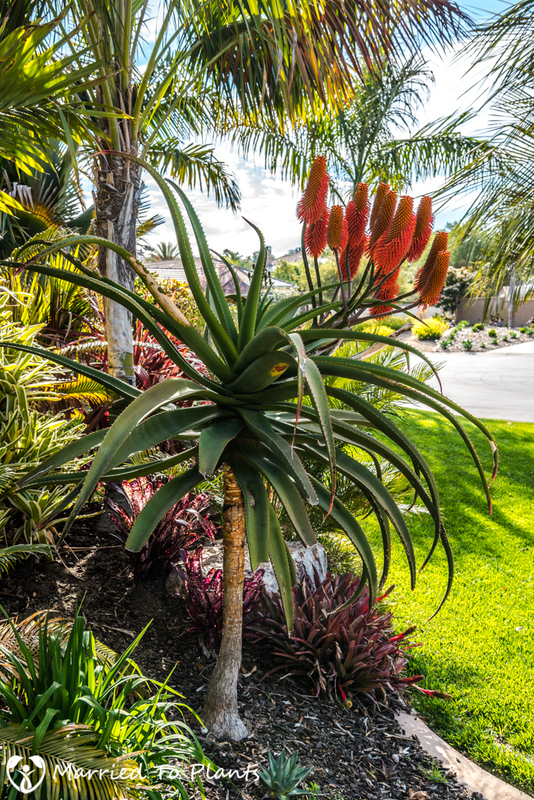 It might even be more abundantly planted than Aloe marlothii. The next two photos show how well my white flowering form of Aloe ferox has responded to all the rain water we have received this year. My yellow flowering form of Aloe ferox didn’t have quite the same floral display as the white flowering form did this year. This is one of my rarer stem-forming aloes. 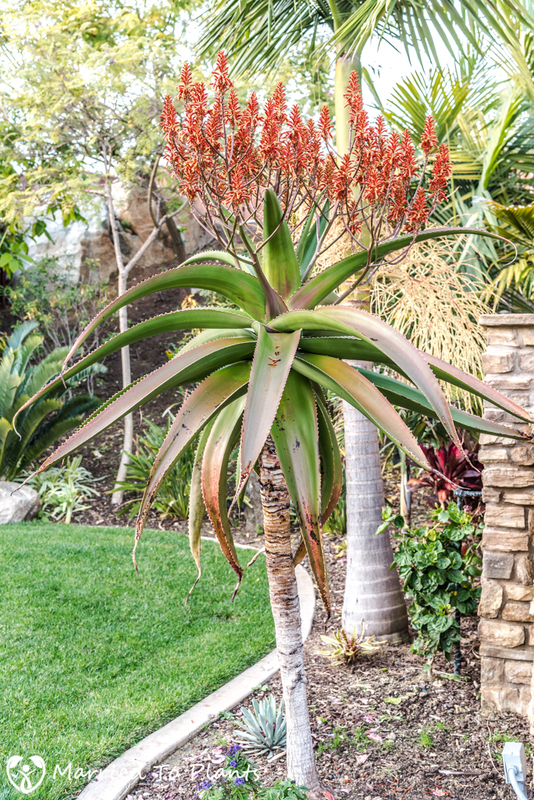 This is Aloe tauri and every winter it colors up like this. 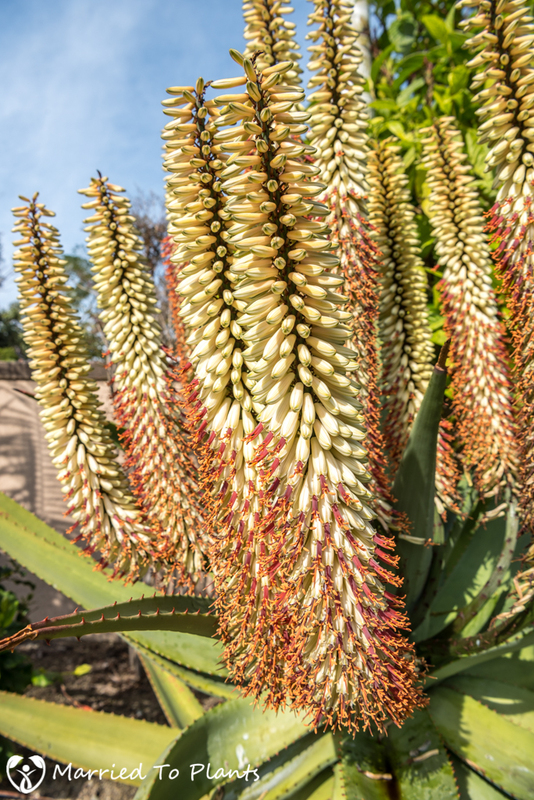 Aloe tauri is closely related to Aloe alooides but it has a shorter raceme and clear nectar, which distinguishes it from the latter. My two Aloe vaombe are getting big fast. They each add about 6 inches of new stem a year. The extra irrigation and fertilizer they get doesn’t seem to bother them like it does for the many other aloes from Madagascar. 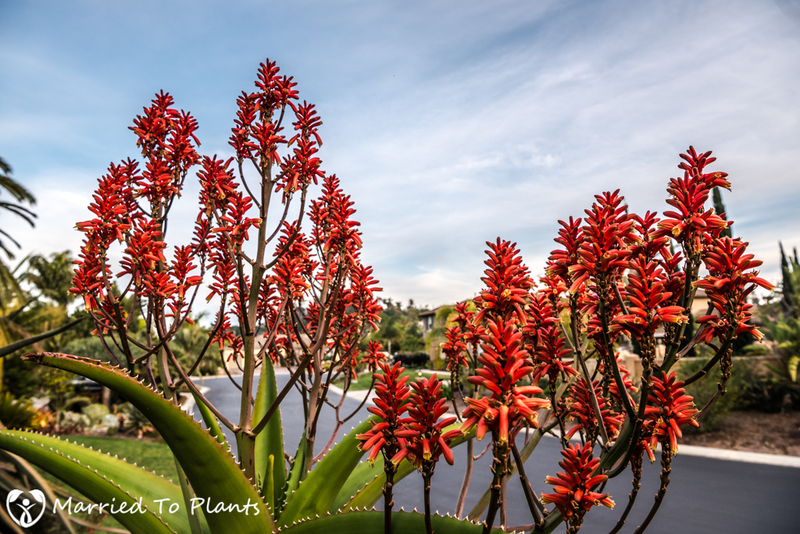 Aloe vaombe in flower is a beautiful site and one I look forward to each aloe blooming season. 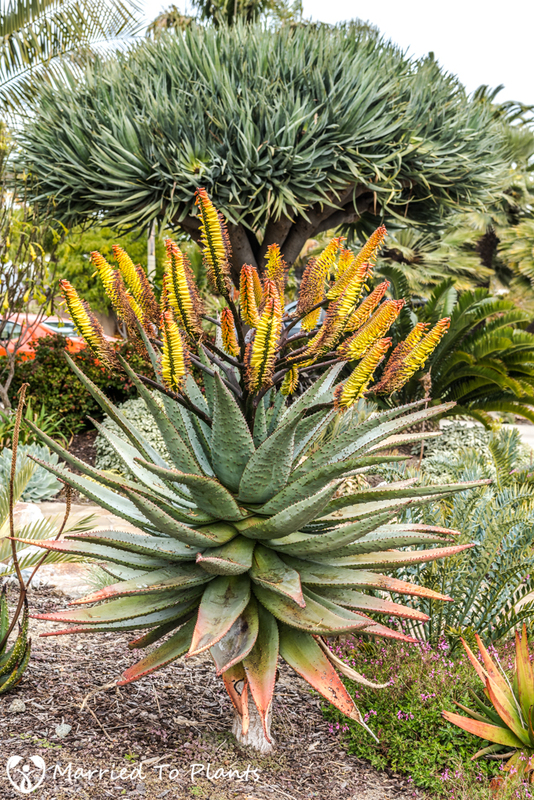 The head of the plant appears to be on fire when flowering, and when compared to most other stem-forming aloes, Aloe vaombe has a longer lasting bloom cycle. 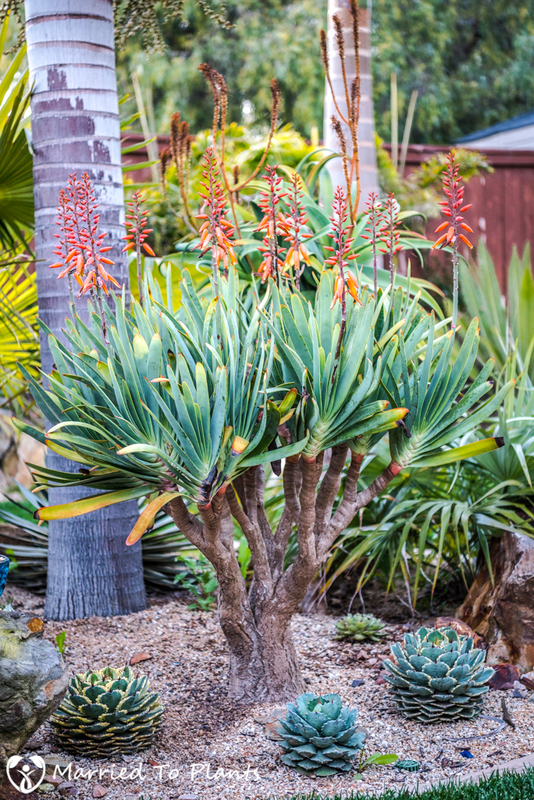 To me it is one of the best overall aloes for Southern California gardens. 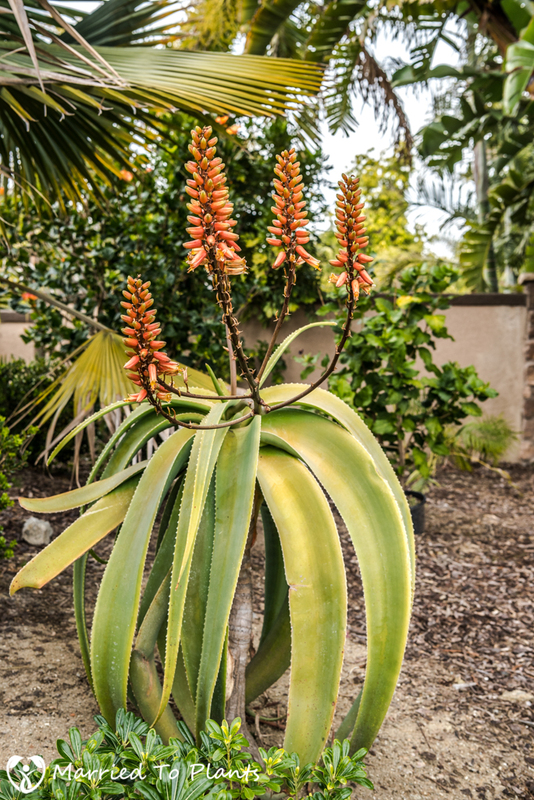 A plant that is closely related to Aloe vaombe (and looks very similar) is Aloe helenae. In flower they are totally different as you can see what the flowers on Aloe helenae look like below. 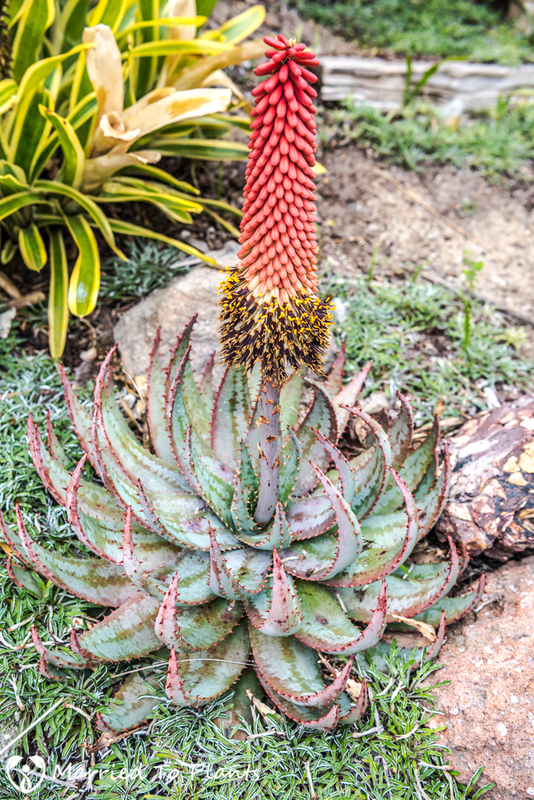 It was rather exciting to see this aloe flowering as this marks a first time for it in my garden for this species. I actually purchased this plant just over three years ago from the SDCSS Winter Sale. 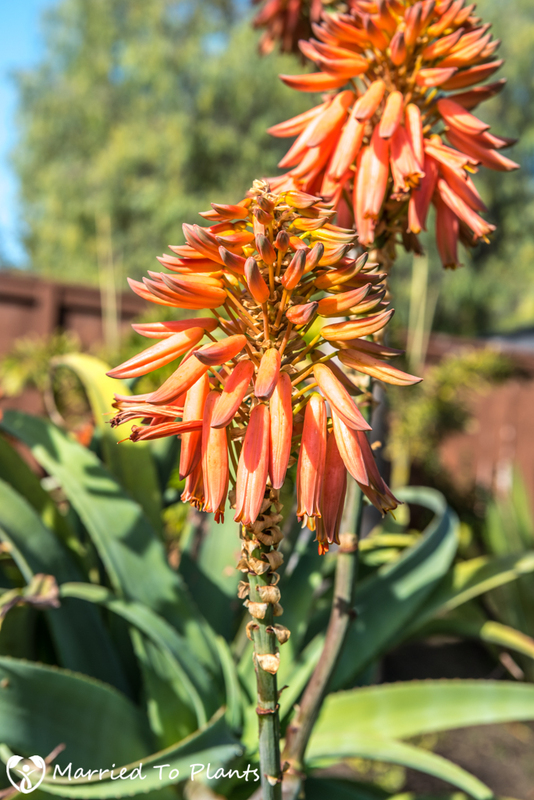 This Aloe helenae is currently flowering, so these blooms have not opened in time for this blog post. Staying in Madagascar, my Aloe betsileensis is easily the most colorful aloe I grow. I just love the bluish and purple tones in the leaves. 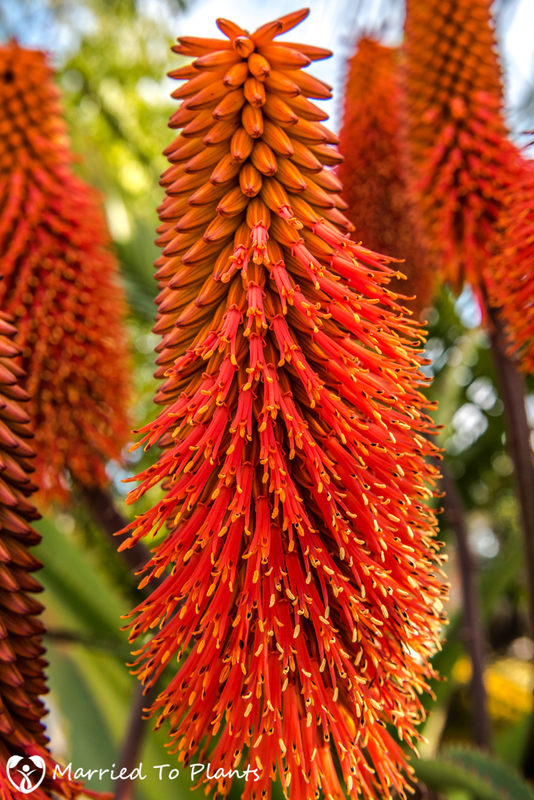 Closely related to Aloe betsileensis, Aloe capitata is another beautiful aloe from Madagascar. Aloe melanacantha was the first aloe in my yard to flower this aloe blooming season. 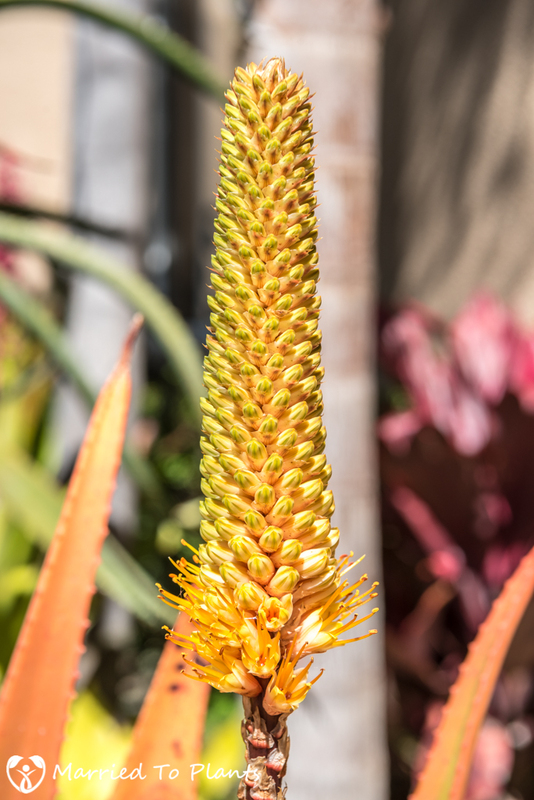 This is one of those aloes that you really don’t grow for the flower because it isn’t all that attractive (IMHO). What makes this plant worth growing is the ball-shaped rosette with black-thorned leaves which curve upwards. Kind of looks like a spiny artichoke. 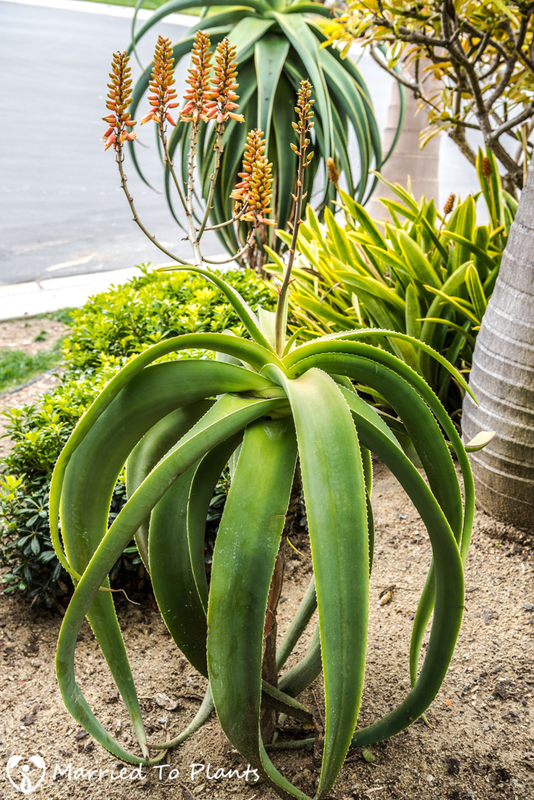 Another thorny aloe with upward-curving leaves is Aloe peglerae. 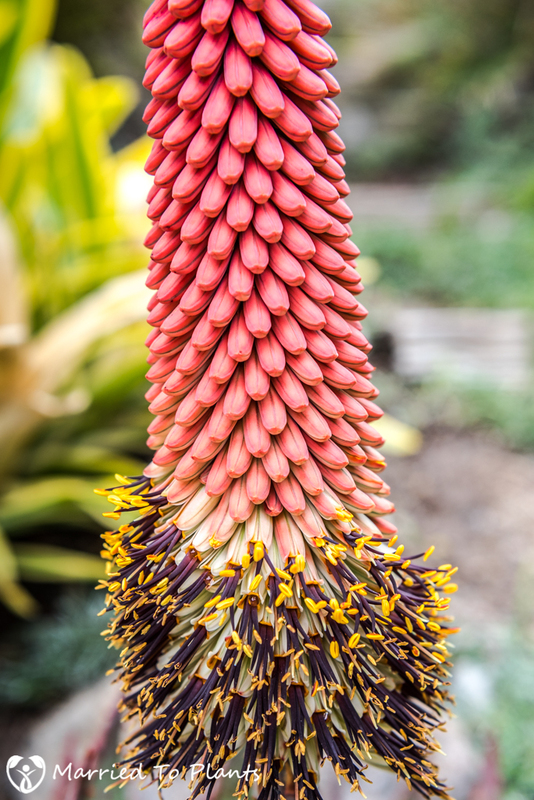 However, unlike Aloe melanacantha, Aloe peglerae has a very attractive flower. The final aloe in this post isn’t even an “aloe” anymore. Botanists have now classified this plant below as Kumara plicatilis. 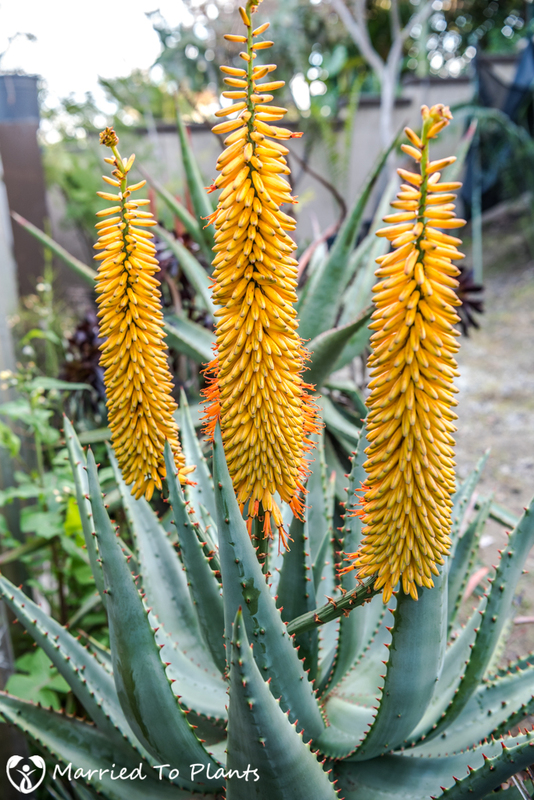 Despite the change in classification, to most it is still called Aloe plicatilis and still carries the common name of Fan Aloe. My plant below usually doesn’t put out many flowers, so this aloe blooming season it was particularly floriferous. 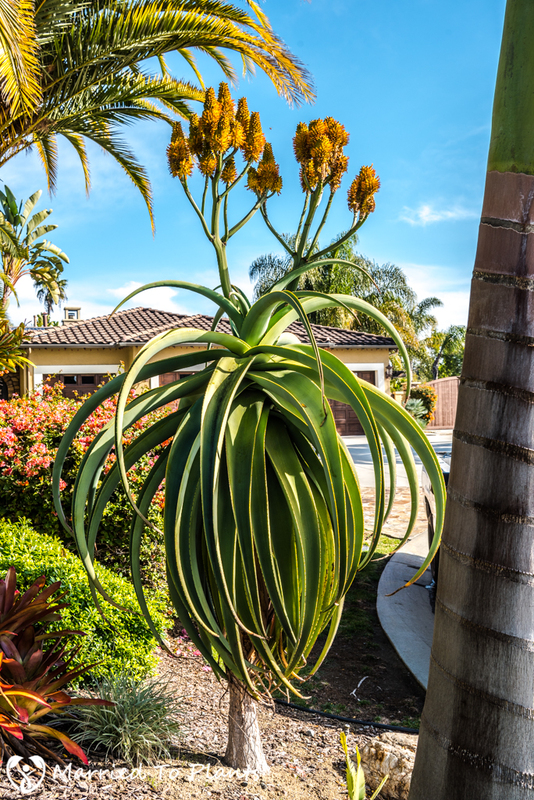 Architecturally speaking, Kumara plicatilis is one of the most unique aloes you can put in your landscape. This is one plant that visitors to my garden usually ask about if they haven’t seen one before. So there you have it. Another aloe blooming season coming to an end in my garden. But don’t be shedding any tears. Spring is right around the corner. 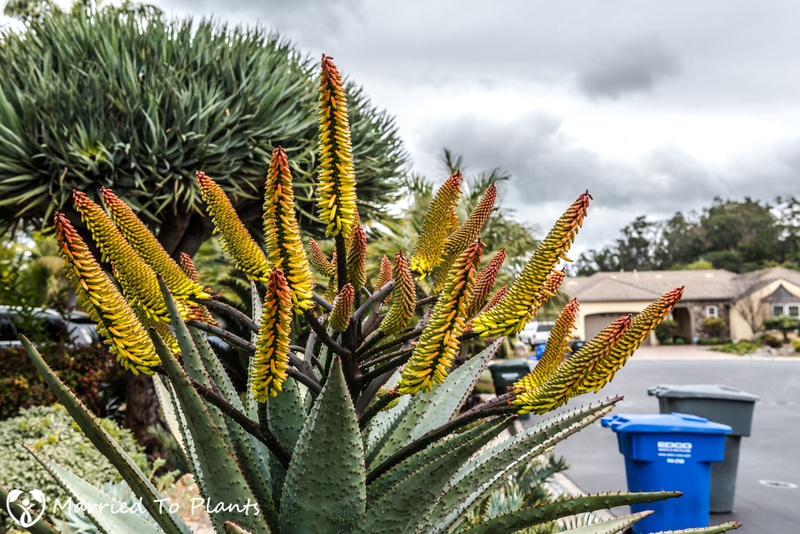 I love flowering aloes. But I love warm weather and longer days much more. 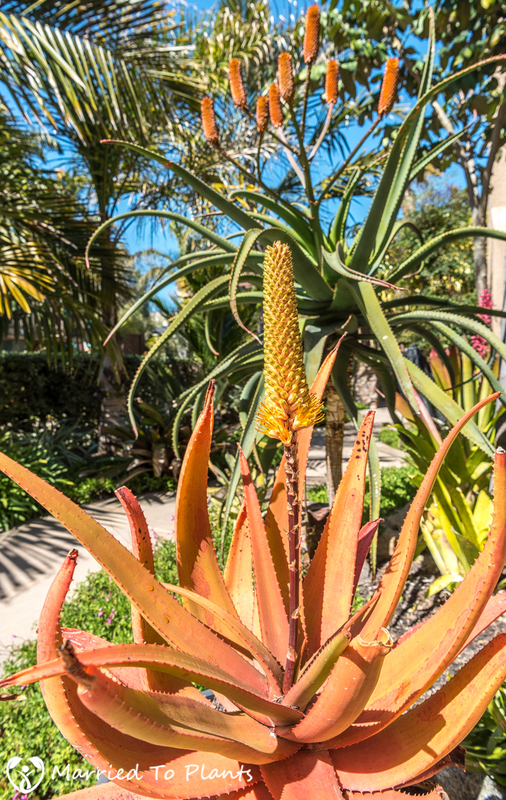 You are so lucky to have access to those aloes. I live in Orlando, Fl and can’t find any of those. I have access to all kinds of bromeliads! You can find most them online. I would imagine your high humidity would be a limiting factor on overall success of many. I’m using the new names for the ‘aloes’ in this comment; yes, the botanists have made it difficult for us with their genus name changes. This ‘problem’ of high rainfall and humidity that you touch on is very much a sore point of mine on the Natal coast of S Africa. Loving succulents, it’s almost always a battle to keep them from rotting. 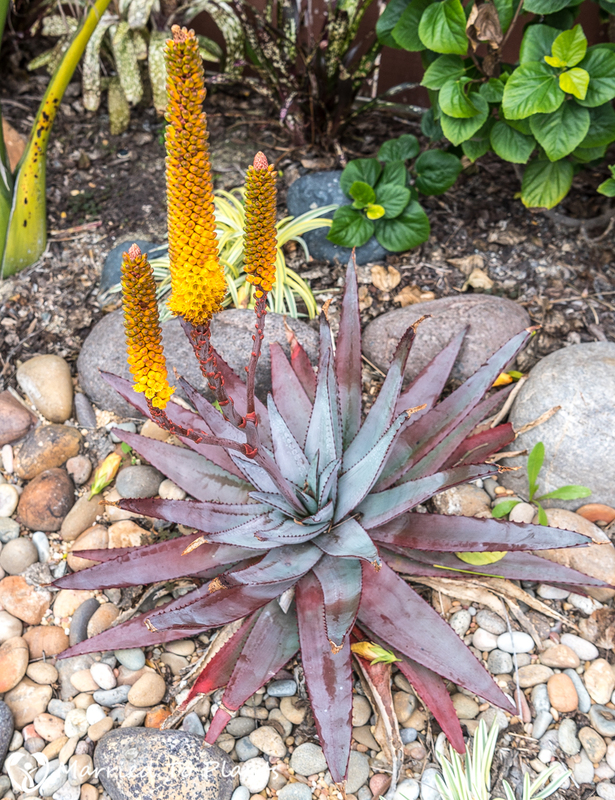 However, as long as her location in Florida doesn’t suffer much from frost, she can certainly grow Aloe thraskii (which grows on our beaches here and enjoys about 1300mm annual rainfall mainly in summer), and if she has space, Aloidendron tongoensis and and Aloidendron barberae among others, as these all enjoy the heat, humidity and high rainfall. Typically, many that I’d love to grow like it dry or prefer winter rainfall (a favourite, Kumara plicatilis). 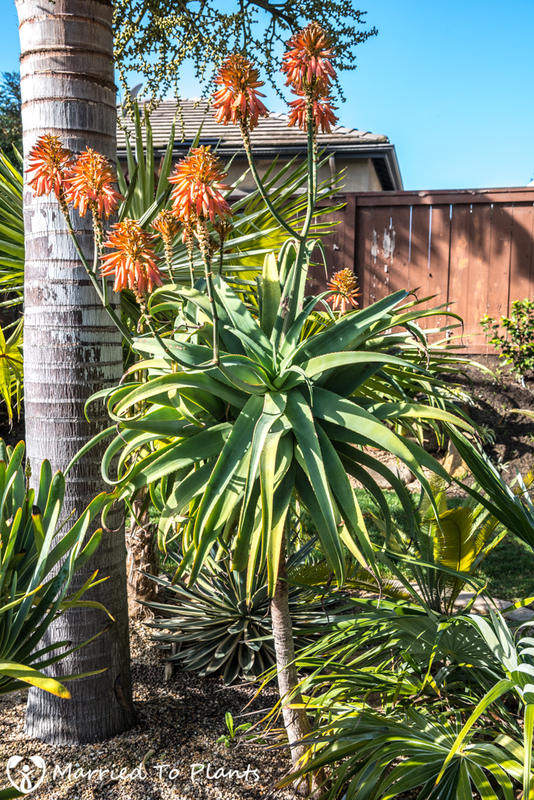 What I find interesting is that those of your aloes from summer rainfall areas are doing so well in S California with winter rainfall. They must be adaptable. I haven’t seen a K plicatilis here but want to try it. I believe it’s relatively slow growing. Yours is looking perfect. I can’t help wondering how old it is. 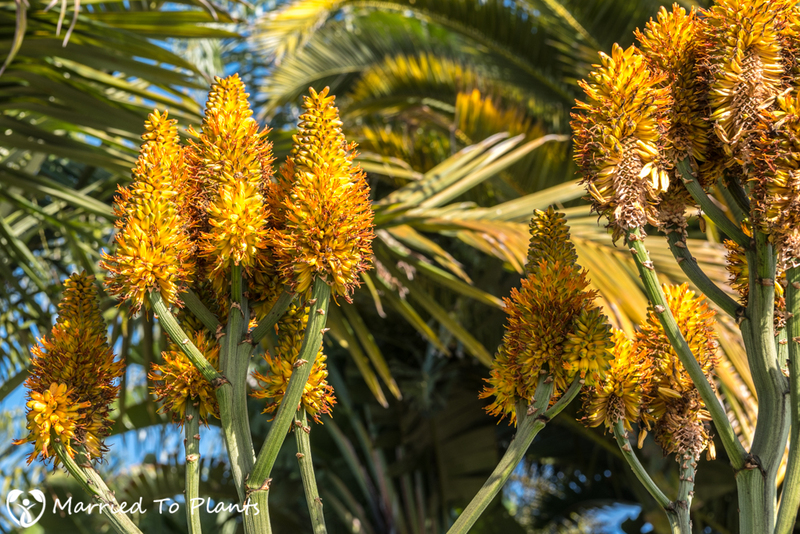 There’s a nice new aloe book out called ‘Tree Aloes of Africa’ by Ernst van Jaarsveld (Struik Publishers), the author of other books on aloes. Thanks Steven for your comments. Always helpful as usual. The Kumara plicatilis isn’t too old as it grows somewhat fast due to the year round irrigation I give it (city water spring – fall, rain in winter). Yes it is interesting how well the plants do here considering it is a wet AND cool/cold winters. Some suffer like Aloe angelica, but most don’t even notice the difference. That your Kumara plicatilis does so well with summer irrigation is enlightening because I’ve read that they need to be kept dry in summer which seemed an obvious problem for gardeners in climates that get mainly summer rain (as you know, their habitat is a med. climate like yours with winter rainfall and hot dry summers). I’m going to try growing this species now in my climate which gets mainly summer rainfall. It works the other way for you, so why not the other way round. As always we shouldn’t underestimate plants’ ability to adapt, and within reason we shouldn’t be afraid to try! Biggest issue is that mine always has brown tips due to city irrigation being high in TDS. Ones in pots not given regular irrigation look much better. 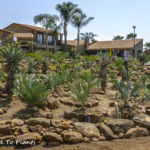 Aloes grow great here. I just can’t find any of the larger ones. Hey we could trade pups!!! I certainly enjoy trading plants. 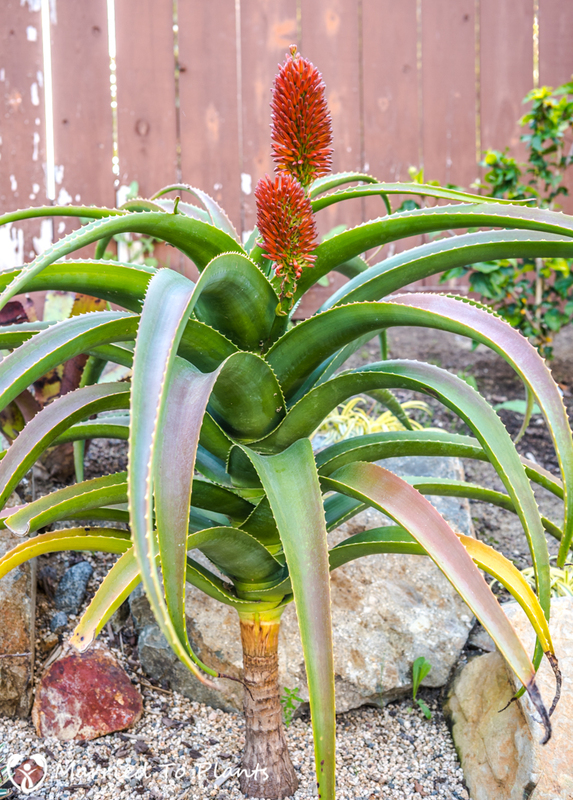 The only issue is the aloes you see in this post are non-pupping. Most are stem-forming. Happy to send seed. Most grow pretty quickly. Did you grow all of those from seeds or did you get them as mature plants? Almost all were mature from local nurseries or other collectors that I traded. Some were small seedlings. I ordered Aloe thraskii. I received a Aloe marlothii from Etsy today. It is beautiful. Thank You so much for the info Steven! Len your aloes are gorgeous!